At $1689 (as configured), the HP Pavilion HPE h9-1120t pushes the "budget" part of the Budget PC category, but that doesn't mean it's not an excellent deal. This desktop has tons of great higher-end features--including multiple USB 3.0 ports and a 2TB hard drive, plus a fast graphics card with 2GB of frame buffer--all at a decent, if not dirt-cheap, price. Our review model sports a third-generation "Ivy Bridge" Intel Core i7 processor (the i7-3770K, to be exact), 12GB of RAM, and a 2TB, 7200-rpm hard drive. 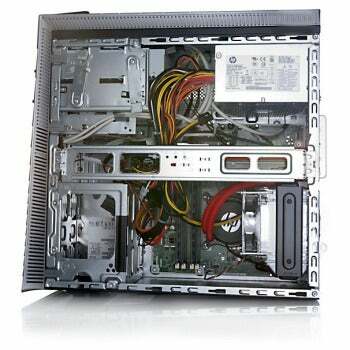 This budget desktop also has an AMD Radeon HD 7950 discrete graphics card, a Blu-ray disc player/DVD-writer optical drive, and an 802.11n dual-stream wireless card. The h9-1120t runs a 64-bit version of Windows 7 Home Premium. The HP h9-1120t performs well for a budget PC. In PCWorld's WorldBench 7 benchmark tests, the h9-1120t scores 121 out of 100, which means it's 21 percent faster than our base testing model. This isn't a big surprise, since our testing model only has a second-generation Intel Core i5-2500K processor and 8GB of RAM. 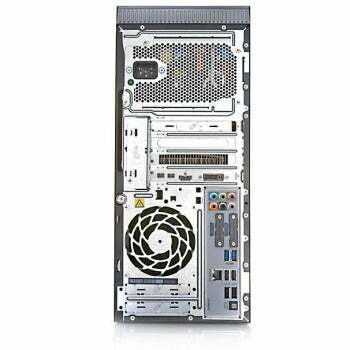 Compared with other budget desktops, such as the MicroExpress MicroFlex 37B, the h9-1120t doesn't look so hot--the MicroFlex 37B scores 172 on WorldBench 7, but it also has a speedy solid-state boot drive, which drastically improves its WB7 score. The HP h9-1120t's gaming score is 87, which is slightly above average for its category. In our Crysis 2 graphics tests, the h9-1120t managed frame rates of between 29.3 frames per second (ultrahigh settings, 2560-by-1600-pixel resolution) all the way up to 96.7 fps (low settings, 1024-by-768-pixel resolution). The h9-1120t's performance is similar to that of the MicroFlex 37B's--that system managed frame rates of between 24.6 fps and 97.7 fps (at same settings and screen resolutions). The h9-1120t is housed in a medium-sized, typical-looking tower. The case has a shiny black plastic front with matte silver plastic accents and flat black metal sides. The right side (if you're facing the machine) has a small angular plastic window through which shines red LEDs, while the left side is stamped with a large HP logo. On the front of the tower you'll find the Blu-ray drive, an expansion bay slot, and a 15-in-1 card reader bay with four USB 2.0 ports. The card reader bay is located under a sliding plastic door, which feels a little flimsy. The power button is located on the top of the tower, along with two USB 3.0 ports and headphone and microphone jacks. The rest of the ports are located on the back of the h9. Here you'll find two additional USB 3.0 ports (for a total of four) and four additional USB 2.0 ports (for a total of eight). There's also a gigabit ethernet port, an optical audio-out, and support for 7.1 surround sound. The AMD graphics card holds the graphics ports: one DVI, one HDMI, and two mini-DisplayPorts. The inside of the h9-1120t is a little messy. Colorful wires are held together with white zip-ties--not neatly bundled into black mesh, but not a rat's nest either. There's one empty 5.25-inch bay, two empty 3.5-inch bays, and one PCIe x1 slot that's both empty and accessible. HP does make tinkering a little more difficult than it has to be by adding metal scaffolding inside the tower--chassis rails that must be removed using a screwdriver before you can start working inside the machine. Our review model, as priced, comes with basic, USB-wired peripherals, though you can upgrade to wireless peripherals or a Beats Audio-enhanced backlit keyboard for an additional $10 on HP's website. The included keyboard is black with silver accents and flat, regular-style keys. It's comfortable to type on, and the large keys give good physical feedback. It's also quiet. There are few frills on the keyboard--basic audio control buttons, as well as an Fn-operated Beats Audio key for toggling HP's Beats Audio software on and off. The mouse is your typical optical affair, with two buttons and a scroll wheel. It feels a little small in my hand, which is significant--I have small hands--and the buttons are a little stiff. The scroll wheel works well, though, and the mouse is quick and responsive on-screen. The HP Pavilion HPE h9-1120t may not be the prettiest or most powerful PC around, but it's a good deal for the price. Not only do you get decent graphics and gaming performance, you also get four USB 3.0 ports, built-in Wi-Fi, a Blu-ray disc player/DVD-writer (for an additional $80 you can snag a Blu-ray disc writer), and 2TB of hard-drive space. The h9-1120 performs well for its class, and is a good choice for budget-minded gamers. If you don't need the extra graphics power, you can also order the h9-1120t with a lesser graphics card: The base model comes with an AMD Radeon HD 7670, which will save you $429. This budget machine is a little on the pricey side, but it packs lots of high end features including four USB 3.0 ports and a large 2TB hard drive.